I love reading everyone's posts. Thank you for giving this avenue for everyone to share! Happy Spring everyone. I never thought it would come. Especially when I was sitting on I-65 during snowmageddon! Lovely Easter weekend on the way. I hope everyone's is grand! 8)Remembering my "Daddy G", the man who started our dairy farm, on the 20th anniversary of his passing. 10. Birmingham Blogging Academy - How to stay well connect to your LinkedIn friends. 11. Y'all Connect - I got a chance to talk blogging with Deb Krier on her radio show. 12. Project Bulk - The latest numbers of my fitness project. 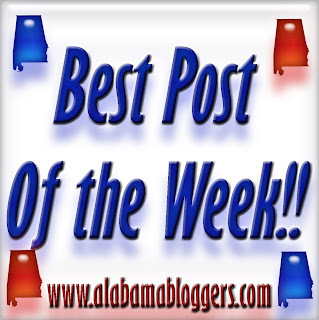 I love this network in being able to see what people are writing about and what is going on in other parts of the state, especially since I grew up in central Alabama and now live in north Alabama. I really like the connectedness among the writers. This week I got political, went to a political meeting thinking I wasn't going to write a thing, how a writer thinks they are going to get by with such was probably not the clearest of thinking. Writers write and they write about the world they live in. I don't know why I feel some kind of pressure to be less political.